The second cervical vertebra, commonly known as C2 is also called the axis. It is a peculiar cervical vertebra which possesses distinctive attributes and significant relations that facilitates its detection. The odontoid process is its most protuberant aspect, which is the body of the atlas or C1 as an embryo. It is vital for rotation of the head, since most of the motion happens nearby the dens along with the atlantoaxial joint. Protruding upwards from the body, it has a strong tooth-like process known as odontoid processk.a. Dens of axis. The odontoid process symbolizes the body of the atlas, which has merged with the body of the axis vertebra. Anteriorly: Anterior arch of the atlas. Posteriorly: Transverse ligament of the atlas. Apical ligament attaches to it at its apex and the alar ligaments attach to it on each side below the apex. The protuberant anterior border of the inferior surface of the body protrudes down to a major extent. The spine deeply grooved from inferior portion and is large, thick and very strong. The transverse processes lack the anterior tubercles and are very small. The foramen transversarium is pointed superiorly as well as laterally. The laminae are thick and strong. 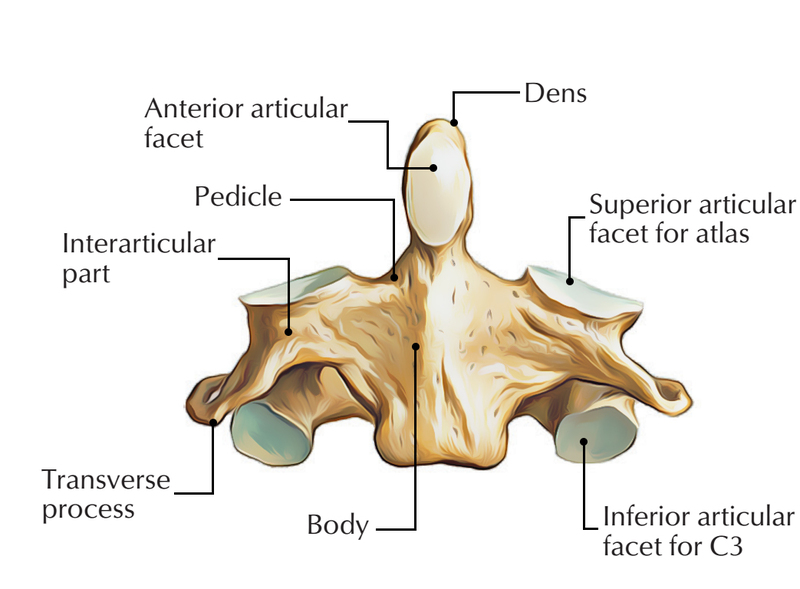 On the upper surface of the body, the superior articular facets spread out onto the pedicles. Laterally, the massive pedicle extends beyond the foramen transversarium. The superior articular facet encroaches on the side of the body and is weight bearing joint. In order to articulate with the equivalent facet of the atlas, it is directed upwards and laterally. 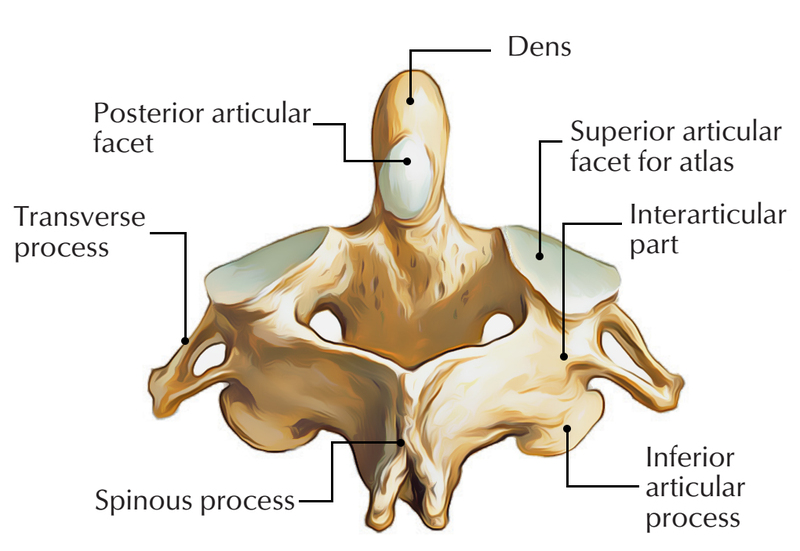 The inferior articular facet is located posterior towards the transverse process and in order to create a joint with the 3rd cervical vertebra is oriented downwards and forwards. The axis is ossifies via five primary as well as two secondary centers. The body and vertebral arch are ossified similar to the corresponding parts in the other vertebrae. The centers for the arch appear about the seventh or eighth week of fetal life, while the centers for the body appear in about the fourth or fifth month. Fundamentals of the lower epiphysial lamella of the atlas and the upper epiphysial lamella of the axis may be found occasionally in this cartilage. The apex of the odontoid process has a distinct center which appears in the second year and joins around the twelfth year, which is known as the upper epiphyseal lamella of the atlas. There is a secondary center along with these on the inferior surface of the body of the bone for a thin epiphysial plate. A medical occurrence which is known as os odontoideum occurs, when due to detachment of the dens from the body of the axis, the nerve and circulation compression syndrome occurs. Type I – This is generally a stable type of fracture. It spreads out via the apex of the dens. Type II – For this region of the axis, it is the most frequently acquired fracture. It has a high rate of non-union form and is unsteady. It spreads out via the base of the dens. Type III – It can be either stable or unstable and surgery may be needed. It spreads out from the vertebral body of the axis. Hyperextension of the upper cervical spine causes a hangman’s fracture. The pedicles of the axis disrupt proportionally and the fracture may spread out through the posterior portion of the body. The dens of C2 always remains intact. Hangman’s fracture has no other cervical skeletal injury with it. Other tissues that may be damaged are the anterior ligament and the disc below the axis, both may be disrupted. Since the spinal canal is adequately broad at this plane, neurological injuries are rare.